what you need, on time. Inventory management is the operational backbone of any business with a product to sell. Inventory management is a very important function that determines the health of the supply chains as well as the impacts the financial health of the balance sheet. 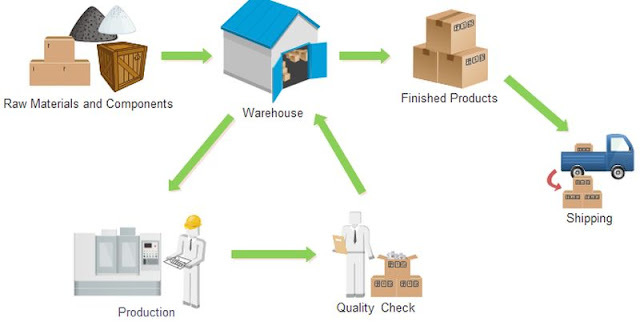 Inventory of materials occurs at various stages and departments of an organization. A manufacturingorganization holds inventory of raw materials and consumables required for production. It also holds inventory of semifinished goods at various stages in the plant with various departments. Finished goods inventory is held by the organization at various stocking points or with dealers and stockiest until it reaches the market and end customers. Semi Finished Production in various stages, lying with various departments like Production, WIP Stores, QC, Final Assembly, Paint Shop, Packing, Outbound Store etc. Ø Manufacturers that work with hundreds and even thousands of parts, components, and other materials. Ø Wholesale distributors with multiple warehouses and suppliers both inside and outside their home country. Ø Service providers that must maintain specific numbers of cleaning supplies, replacement parts, and other items to serve their customers. Ø Government agencies looking to track their assets across wide expanses and to serve a large number of people. Ø And many others, ranging from SMBs to large organizations.